Over 40 years ago, when Jacques Lardiere was just in his second year with the venerable domain of Louis Jadot in Burgundy, he proved his skills in a vintage that challenged everyone. In some years, France encounters an extreme heat wave known as la canicule and so it was in 1971. “It was even hotter than in 2003,” remarked Lardière. In 2003, thousands of French people – particularly senior citizens – died from heat exposure. I recall having toured the Rhone Valley in August 2003, seeing endless rows of withered and downcast sunflowers, some grilled by the heat. In a room in Avignon without air conditioning (fans sold out), I slept on the floor next to the fridge. It was that hot. And so it was in 1971. Even worse, Lardière said, in the torrid month of July. “The grapes accumulated more sugar and potential alcohol more rapidly than in 2003,” he explained. By July in 1971, the degrees in alcohol were over 10, whereas in 2003 by the same time, they were only between 8 and 9. And unlike in 2003, August in 1971 was marked by hailstorms that harmed the grapes resulting in a goût de grêle (a moldy smell meaning literally the taste of hail, Lardière explained). So what did Lardière include over a lunch in Beaune? A lovely 1971 Beaune Greves 1er Cru. How did he manage? After a careful selection of grapes in the harvest, he recommended an incredibly short period of maceration – the contact between freshly pressed grapes from the harvest and the skins, which builds tannin and color into the wine. Normally, maceration runs three to four weeks, but in 1971, it was cut to only about … 10 to 12 hours, Lardiere explained. Management was not sure what to do, he recalled, because just the year before, he advised a much longer maceration period. But they assented to his advice. 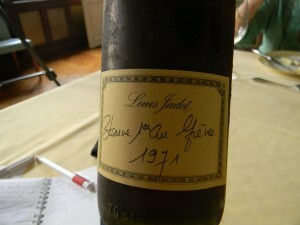 The result is that many Louis Jadot wines from the challenging 1971 vintage taste quite good. 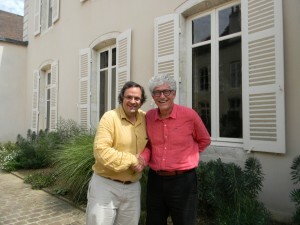 Lunch in late August with the soon-to-retire winemaking director at Louis Jadot in Burgundy, included more surprises. 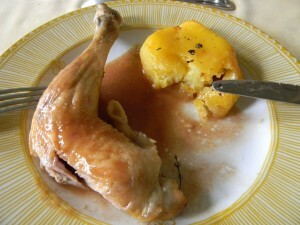 While the tender, perfectly roasted poulet de bresse proved predictably delicious, what a revelation it was to experience a lively and opulent white wine from 1992. Because the 1992 vintage in Burgundy was rather warm, I expected flabbiness, but got verve instead. 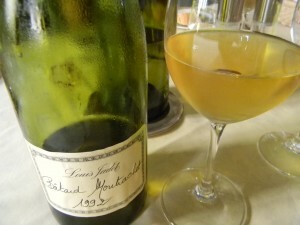 The Batard Montrachet enjoys an exceptional microclimate and soils, and Lardière would never say that he “made” the wine. But 20 years ago, he did not allow for malolactic fermentation, which is the natural conversion of more pronounced malic acids to softer lactic acids. He said that he “disturbed” the process – by racking the wines from one barrel to the next in specific moments – so the more lively malic acids were preserved for the 1992 vintage. “The wine retains life and energy,” he said. We also had a still very youthful and energetic Gevrey Chambertin Les Cazetiers 1er Cru 1996. With time in a carafe, it opened up, but the wine is still a somewhat nervy baby! Plenty of depth, too. 1996 is a long term vintage and will reward more time in your cellar. 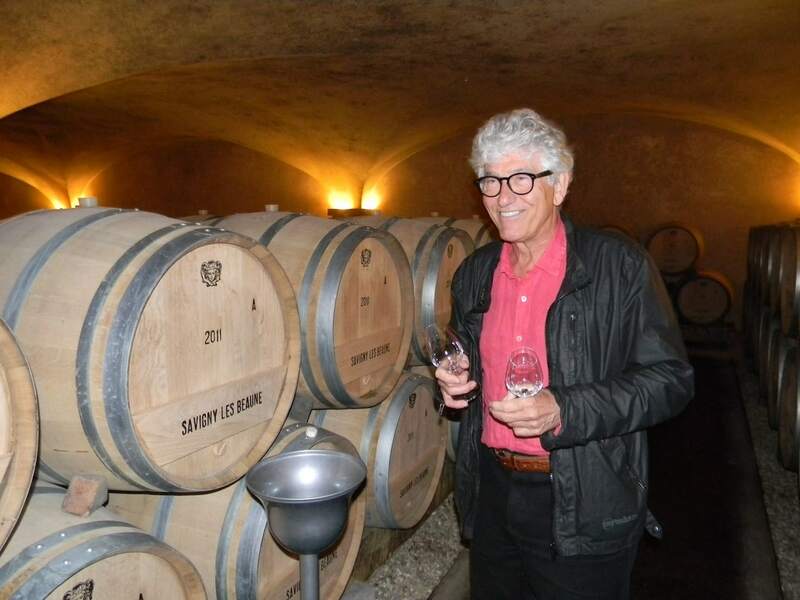 Genuinely humble, Lardière exudes both scientific knowledge and passion – and he has justifiably earned a reputation as one of Burgundy’s top winemakers who will be missed. 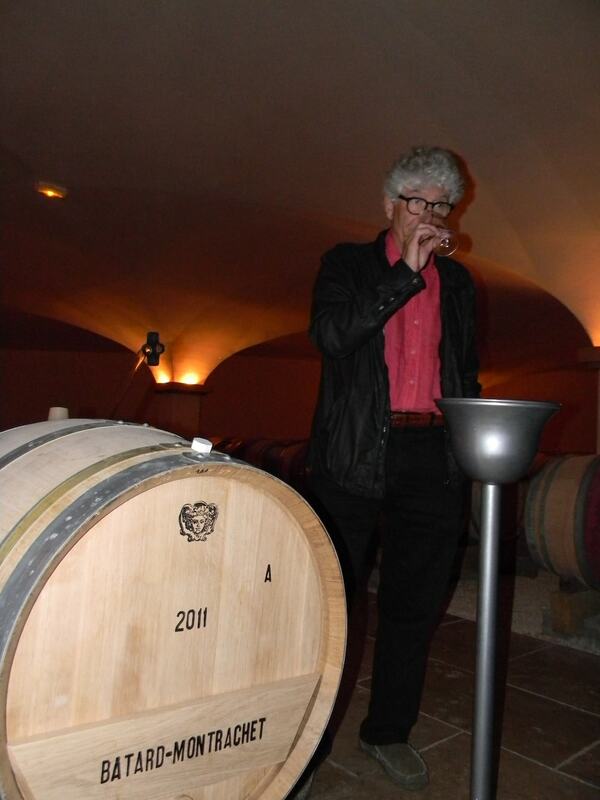 Born in 1948 in Vendée, France, Lardière decided at an early age to dedicate his life to winemaking. 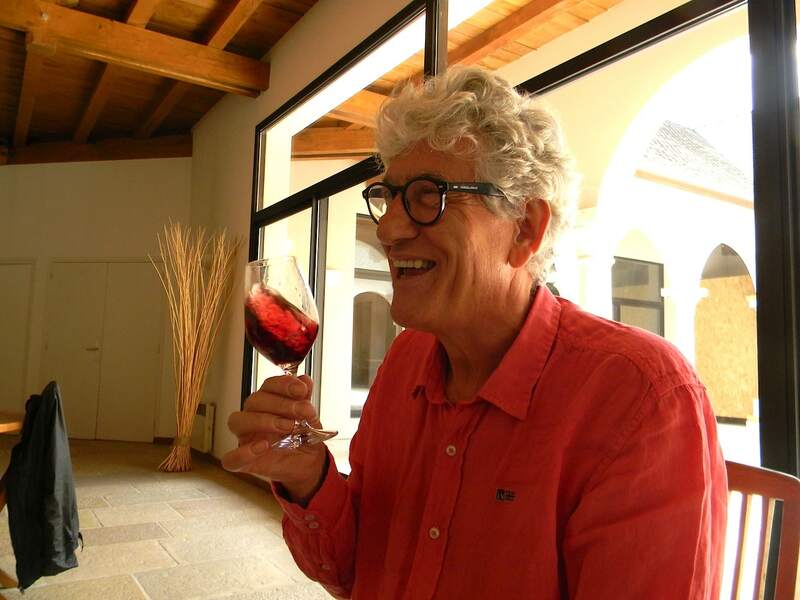 Graduated with distinction from the school of Viticulture and Enology of Alentours in Mâcon, he was drawn to research in the biology of aromas and bacteria under close association with Jules Chauvet, who was an expert taster and had studied aromatic identification in wines. Lardière was 20 when he met Chauvet, whose published research on malolactic fermentation proved very important to Lardière. Although Lardière generally likes to preserve at least some malic acid in white wines, he also adapts to conditions. On rare occasions – such as the already highly acidic 2008 vintage – he allowed malolactic fermentation to run its course. He mentioned that for example, as we tasted through several 2011s aging in barrel. When we arrived at the Saint-Aubin 1er Cru Les Murgers des Dents de Chien, it really was like sharp teeth – with a bracing acidity. Not quite ready yet, but certainly full of energy. 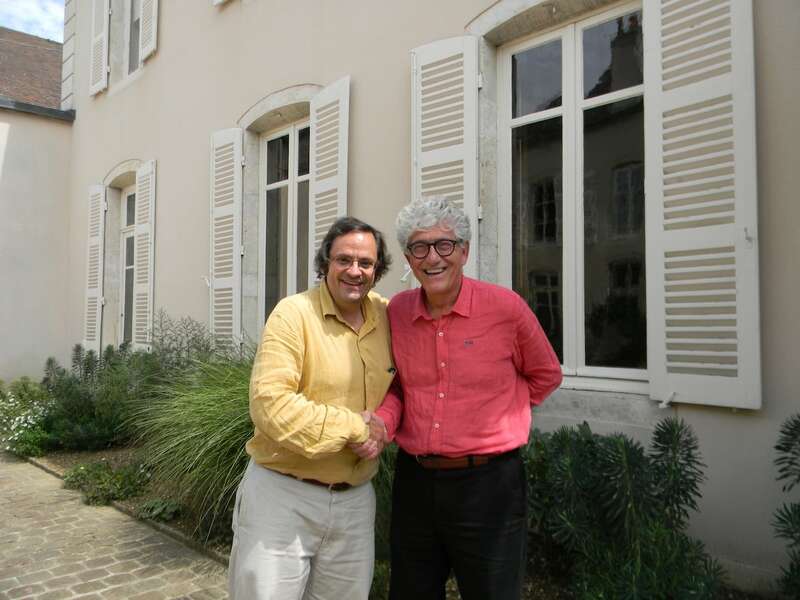 Each time I have visited Lardière at Louis Jadot, I have always learned something and thoroughly enjoyed my visit. He conveys passion and knowledge and is always ready to taste another barrel sample. Comments are made with one village, then we go to the next… and the next. And the comparisons are exciting because he loves to explain the differences in the terroirs tasted. All the while, explaining the particular conditions of a given vintage. 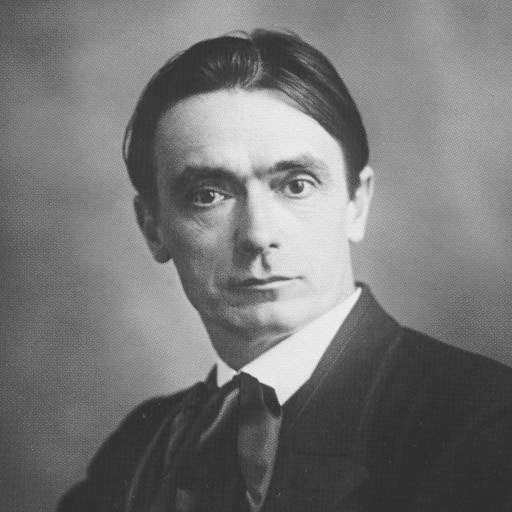 When I asked him about some of the people who influenced his work, Lardière stressed Rudolf Steiner, the Austrian philosopher and social reformer, who is considered to be the father or organic farming and viticulture. In 1924, Steiner advised a group of farmers concerned about the future of agriculture to adapt ecological and sustainable approaches to increase soil fertility without the use of chemical fertilizers and pesticides: a basis of organic winemaking and biodynamic viticulture, praised widely today. 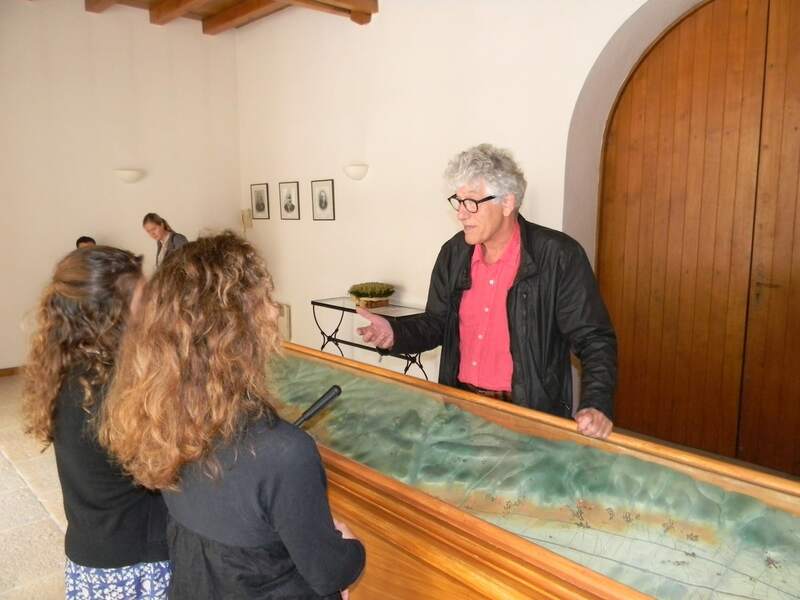 Lardière says that he is a non-interventionist and wants the terroir to speak for itself. One example is not stirring the lees (dead yeasts after fermentation) in barrel, which some people do to add more flavor to the wines. But Lardière believes that such a practice is “forcing” the wine. The end result, Lardière explains, is that a wine “opens itself to people” or “liberates life”, between l’anabolism (energy expended to build up molecules from smaller units) and le catabolism (breaking down of molecules into smaller units to create energy). Deep stuff. 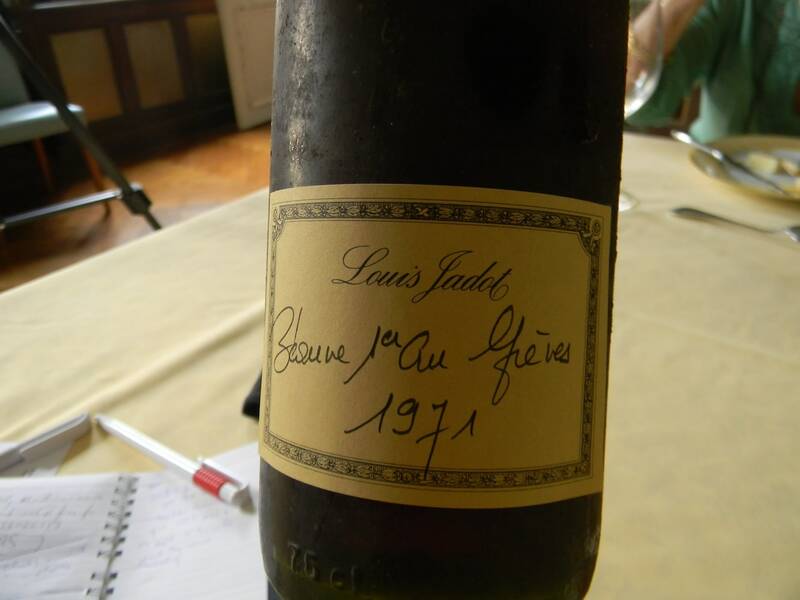 But it all came together with our final wine over lunch, from the vintage that put Lardière on the map at Louis Jadot: the “completely strange” 1971 vintage. Starting as Gagey’s assistant, Lardière was named technical director in 1980. Together, they pursued a policy of expanding the company’s vineyard holdings and improving and maintaining the quality of its grapes, which meant control of the entire production process, starting with growing the grapes themselves. Thanks to investments provided by Louis Jadot’s American owners, the Kopf family – of Kobrand importers – Lardière used his skills on an increasing number of vineyards. Today, with nearly 400 acres of vines, many of the company’s wines are made from grapes grown from its own vines or in vineyards under its management. Because Lardière generally uses similar winemaking for most all appellations – from village wines to grands crus – one can obtain a good understanding of a given vintage’s character, as terroir differences are stressed. For example, before lunch, we tasted two exceptional red wines from the 2011 vintage still in barrel, both made roughly the same way. But while the Echezeaux Grand Cru exuded floral and elegant aromatics, the Clos St Denis Grand Cru seemed earthier, richer, and more substantial – with just as much aromatic interest. 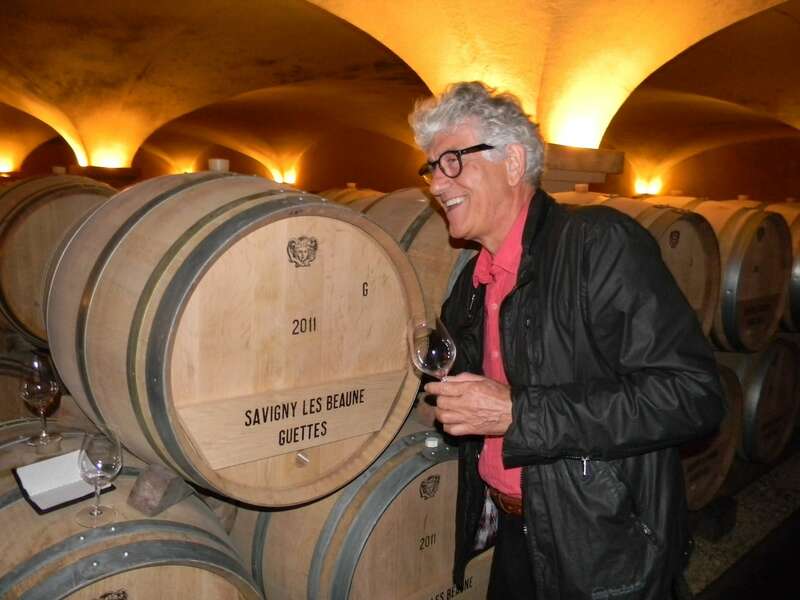 “We want the terroir to speak for itself,” Lardière emphasized. 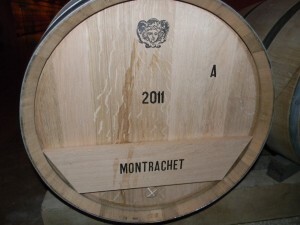 Based on our tasting of many whites and reds, Burgundy fans should know that 2011 promises to be a fine vintage. While tasting the broad array of appellations at Louis Jadot, I got the impression that many whites, from humble village level appellations through to the grands crus, showed both energy and richness. The reds seemed elegant and soft with a ready and pleasing ripeness. Indeed, Lardière said that the reds in 2011 are – overall – “softer” than the reds in the 2010 vintage. Over lunch, as we sipped on the fine Gevrey Chambertin Les Cazetieres 1996, Lardière took some questions on other vintages. But not before making a point to praise wine’s agreeable effect on people: he spoke of a state of “fulgurance” – a certain explosion of pleasure. There was veritable joy in this explanation, which was contagious. He then explained that it is not always easy to anticipate when a wine will be ready to drink, when it will reach its apogee. Take 2005 and 2006. While 2005 is universally regarded as a great vintage, some wines will need more time to reach their best moment for drinking. The 2006 on the other hand, is already in some cases ready to drink today. The 2005 experienced a smaller and cooler harvest and higher degrees of both tannin and acidity than in 2006. So that means that the wine will take a longer time in bottle to reach its liberation, its apogee… its harmony. He gestures with his hands with expressive force. The 2006 is a softer vintage, with less tannin and less pronounced acidity. It will be ready to drink sooner. He also likens 2009 to 1959. All I can say after having tasted the 2009s from barrel, a couple of years ago, is that some Louis Jadot wines from that vintage – white as well as red – are brilliant. I immediately purchased the Gevrey Chambertin Clos St Jacques 1er Cru and would highly recommend the Puligny Montrachet Les Folatieres in 2009 as well. Complete notes from that tasting HERE. The future looks bright with Lardière’s replacement, Frédéric Barnier, 36, who joined Louis Jadot in 2010 as technical director, under Lardière’s stewardship. And you can read more about this in my full article in the October issue of France Today! My overall impression of 2011s from barrel at Louis Jadot was positive. I mainly tasted the grands cru reds (poor me), along with a somewhat broader spectrum of whites. I have the gut feeling that the reds, while good, may not be as good as the 2010 vintage which seems to have more verve and grip. 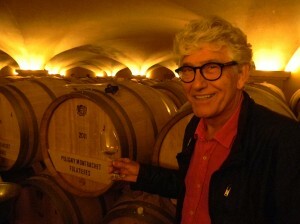 Lardière said that the 2011 vintage will be “softer” than the 2010, on a general level. Also, some appellations excelled more than others. For example, I preferred the Clos St Denis Grand Cru to the Echezeaux. The whites seemed quite fine across the board. Yields in 2011 were 10% lower than average, while in 2010, it was 40% less. So there will be more 2011 wine produced, but still below the average. You can read my report on harvest conditions at the end of August 2011 HERE. Savigny Les Beaune Les Guettes: More nuanced, with sunflower and herbal aspects. Delicious ! St. Aubin Dents de Chien Premier Cru: This was a bit closed with the acidity showing through like steel… Needs time in barrel to be sure. Meursault: Fine red apple notes, with a touch of butterscotch make this a textbook Meursault. Meursault Les Genevrieres 1er Cru: Deeper nose, as expected, with subtle spice, more palate opulence than the village edition – but needs time certainly to be complete. Puligny Montrachet: Here we have a more focused nature, more laser like, and yet also sumptuous. A great success for the village wine. Puligny Montrachet Folatieres 1er Cru: Greater breed. A remarkable hay-like aroma on the nose, exuding mineral and herbs as well, precedes a deeper palate, but very focused, finishing with subtle licorice notes. Wonderful! Puligny Montrachet Clos de la Garenne 1er Cru: The nose needs coaxing, but even then, it is rather closed; the palate is richer than the above – even thicker. Not rustic by any means, but broad and fleshy. Give it time. Batard Montrachet Grand Cru: Here a very mineral aspect on the nose precedes a deep palate, rich. And yet! I have this feeling that I prefer Les Folatieres! Chevalier Montrachet Grand Cru: This may have been my favorite white of the tasting: what laser like precision combined with beautiful opulence on the palate! Like a better version of Folatieres. Corton Charlemagne Grand Cru: On a somewhat lighter register than the above, not matching the layers, but just a beautiful expression of white flower, hawthorne, with fine acidity and freshness. Certainly a grand cru that is more economical than the above! Echezeaux Grand Cru: As expected, violet infused, flowery elegance. A texture that is silky and pleasing. Quite nice in 2011! Clos St Denis Grand Cru: While the aromatics are just as pleasing, with deeper tones of red and black fruit – as well as violets – the palate has more depth and substance. A great success in 2011. Clos Vougeot: I thought it could not get better, but Louis Jadot did a great job with Clos Vougeot in 2011, displaying cinnamon and spice, touches of musk, and a rich palate and long finish that make this quite a substantial wine. 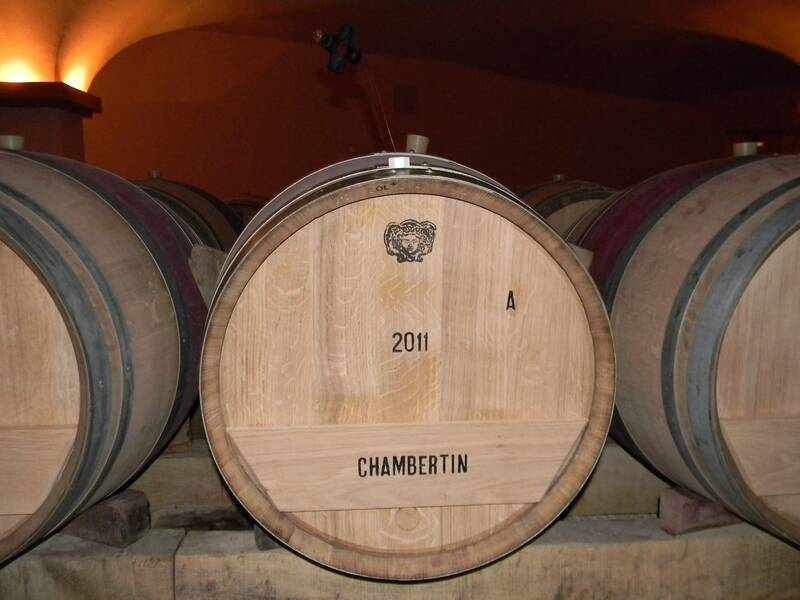 Chapelle Chambertin Grand Cru: Here a pure sense of cherry, especially on the palate. The nose seems subdued at this stage! 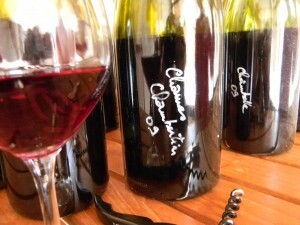 Chambertin Clos de Beze Grand Cru: What depth! On the nose and on the palate, this exuded a minerality that impressive. Chambertin Grand Cru: A peak to be sure, perhaps the very best so far, with pure cherry and mineral on the nose and palate, with such depth and subtle full body. And a lingering finish. Bonnes Mares Grand Cru: Here we have a more floral aspect combined with ripe cherry and a smooth aspect on the palate. Perhaps not as deep as the preceding wine, but nuanced. Musigny Grand Cru: This rivals at last the Chambertin, in that its peerless floral aromatics are also matched by impressive depth on the palate that matches the Chambertin. Beaune Teurons: A brisk attack preceded a medium bodied aspect, marked by a certain tannic edge – just a bit firm, but showing much promise for aging over the next couple of years. Beaune 1er Cru “Clos des Ursules”: The original Jadot vineyard, this wine was deeper and richer than the above, with more evident expressions of red and black fruit. Very fine! Gevrey Chambertin Les Estournelles St Jacques 1er Cru: The largest scaled wine so far, displaying more complex layers of flavors than the above – freshness and florality as well as dark fruit – with excellent grip. Chambolle Musigny: A charming ripe cherry nose precedes a fleshy palate. Difficult coming after two grands crus, but good quality here for a village wine in a very ripe vintage. Gevrey Chambertin Les Cazetiers 1er Cru: Here we have more distinction in the cherry expressions. The tannins are more “complete” in that they seem more refined, with a smooth texture. A lovely wine! Charmes Chambertin: Another fine impression here, with more depth than the above, but I found this just a bit closed in… it should reward time in your cellar. What a wonderful tasting and lunch! Puligny Montrachet: Fine and crisp for the vintage. Rich, too. Meursault Les Charmes: Here we have a richer wine, with sap and unctuous flavors. Chevalier Montrachet: Delicious notions of freshly cut hay combine with ripe green apple to convey a brisk richness. A lovely wine! Love Jadot’s wines, esp. the reds. Their various Beaune premier crus may be the best values in Burgundy. Generally can get all but the Ursules for $30-$40. For that, you get a wine that can easily age 20 years and then show brilliantly. Had a 1999 Beaune Bressandes at l’Ecusson last year that was wonderful and has many years to go. Thanks for reading Howard! Looking forward to seeing you again in … less than four months! A wonderful day indeed!! Thank you to Jacques for his hospitality and for sharing his passion with us. And to you dear brother for taking us on a magnificent tour!